Thin foam, on large areas, has less chance of distortion and reverberation reverberation. Tested to eliminate acoustic waves and chatter. Buying your own bubble is the best way to adjust your area without employing a professional acoustician. Sound-absorbing sponge is on the basis of sponge for further processing, acoustic inside the sponge. and reflection of the increase in the number so as to achieve the noise, sound-absorbing effect. Note: Light shooting and different displays may cause the color of the item in the picture a little different from the real thing. Thin foam, over a large area, has less of a chance of distorted and muffling the sounds reverberation. The Wedges in the photo will be exactly what you get. The uniform wedge design help trap airborne noise while alleviating flutter echo and slap back. For maximum noise absorption. 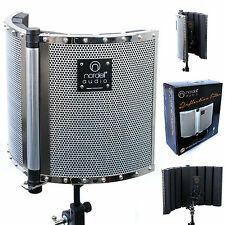 Helps to flutter echoes and reduce excess reflections and reverberation. Improves vocal clarity and acoustics of your room; Highly fire retardantSound vibrations are broadcast through the air, causing issues with noise entering and exiting your house studio. 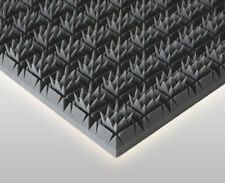 This sound absorbing panel is designed to reduce echo within an environment. The Bass Trap Studio enhances the sound quality and aesthetics of any recording or listening environment. Applications: Auditoriums, Broadcast Studios , Computer Rooms , Equipment Enclosures , Equipment Rooms , Gymnasiums , Gun Ranges, Home Recording, Studios, Home Theaters , Industrial Facilities , Professional Theaters , Professional, Recording Studios , Warehousing FacilitiesCutting: 1. Use the m.
MICBOOTH-911 DOOR ENCLOSURE ONLY...!!! PLEASE READ!!! Well Guys Here It Is. This Is Just For The Enclosure Only. In Your Bedroom. Without All Of The Hassle And Expense Of Building Materials And Labor.Plus The Best Part. These are very effective in stripping out the room echo and reverb. IsoAcoustics ISO-130 Acoustic Isolation Studio Monitor Stands Pair, Small. This next generation of speaker stands effectively eliminates energy transfer into the supporting surfaces. Designed for smaller speakers and studio monitors. This Is A Great Stand In Vocal Booth. Portable Stand-in Vocal Booth For Travel. Stand-in Vocal Booth. DON'T RECORD YOUR VOCALS BEHIND A VOCAL SHIELD ONLY.RECORD YOUR VOCALS IN A MIC BOOTH. LIKE THE PROS DO. MICBOOTH-911 SURROUND BLANKET ONLY...!!! PLEASE READ!!! This Is Just For The SURROUND BLANKET Only. Well Guys Here It Is. 1 72"x 80" 6.5lb BLACK Blanket. 13 Pipe Rings Made Onto Blanket. DON'T GET A MIC SHIELD. GET THE MICBOOTH-911. MICBOOTH-911.Go Get It.! Auralex SubDude v2. SubDude v2 Features. The SubDude-II™ is an incredibly effective isolation platform that instantly improves your subwoofer’s performance. © 2018 Perfect Circuit. If you experience a problem with a unit:do not attempt to open or repair the unit yourself. X2 with VINYL x2 without. 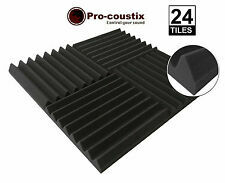 4" Thick Acoustic Soundproofing Foam Stylish Kit overall size 84"x 36"
4" Thick Studio Acoustic Soundproofing Foam Kit overall size 84"x 36". FEATURES: Make you room look amazing. With this kit you do not have to cover the whole wall with acoustic tiles. You can group pieces together or separate the pieces, which will soundproof your room. Back is zippered to allow easy microphone insertion and removal. Portable and folds flat for easy storage and travel. All our soundproofing foam is cut and angled with nearly 100 percent accuracy, leaving you with clean, squared edges. 2" x 12" x 12" Brown and Charcoal Acoustic Foam. 2" x 12" x 12" Red and Charcoal Acoustic Foam. The Marantz Pro Sound Shield Live can be mounted to any standard microphone stand via its built-in threaded insert. 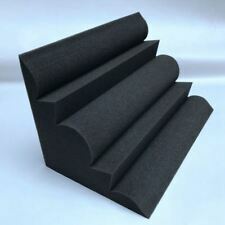 This recording baffle uses high-density acoustic foam to prevent echoes and reduce ambient noise to a minimum, resulting in a cleaner recording even under undesirable conditions. Schaumstoff der Güteklasse R25/S44. Optimierung der Raumakustik. Etwaige Raumresonanzen können effektiv. Regel hinter den Lautsprechern. Nach Bedarf und Raumgröße können diese auch übereinander getürmt werden um so eine präzisere und. All our soundproofing foam is cut and angled with nearly 100 percent accuracy, leaving you with clean, squared edges. 2" x 12" x 12" Green and Charcoal Acoustic Foam. The VocalShield VS1 is an essential tool for enhanced performance and a vital accessory for the professional musician. Foldable, stand-mounted acoustic microphone shield. 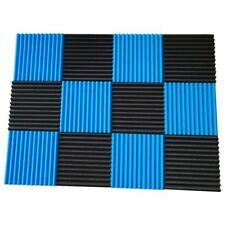 High-quality micro cell acoustic foam. 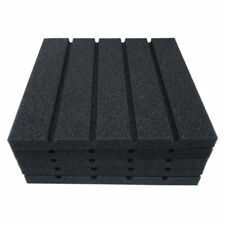 This foam is specially formulated (extra additives) specifically for acoustical sound-deadening applications. Install these panels on your walls to greatly reduce echo. Available in 12 different colors, its typical life is 5 to 10 years. All our soundproofing foam is cut and angled with nearly 100 percent accuracy, leaving you with clean, squared edges. 2" x 12" x 12" Red and Charcoal Acoustic Foam. BLACKOUT - ACOUSTIC FOAM. Manufactured from high quality acoustic foam to exacting British standards in Compliance with UL94 HF1 classification. Would you like to make your own Skyline Diffuser but don't have any tools?. Look no further. Looking for a Diffuser but cost too much money?. Diffuser blocks 1” - 4” all pre cut. 2" - 38 Blocks. 1" - 38 Blocks. All our soundproofing foam is cut and angled with nearly 100 percent accuracy, leaving you with clean, squared edges. 2" x 12" x 12" Purple Charcoal Acoustic Foam. Marantz Professional Sound Shield. Professional Vocal Reflection Filter EVA. - Accurate sound attenuation courtesy of five absorptive walls featuring sculpted sound-absorptive surfaces, backed by high-density EVA foam. All our soundproofing foam is cut and angled with nearly 100 percent accuracy, leaving you with clean, squared edges. 2" x 12" x 12" Pyramid Foam Sheets. All our soundproofing foam is cut and angled with nearly 100 percent accuracy, leaving you with clean, squared edges. 2" x 12" x 12" Orange and Charcoal Acoustic Foam. The artistically designed Aperta stands raise the bar to set a new standard for remarkable acoustic isolation and performance. We'll do everything we can to help get that next piece of gear into your hands. Sonitus BigFuser I Skyline Diffuser Raum Akustik. Zum Glück geht das heute ganz anders. Sonitus hat hier wieder in die Akustik Trickkiste gegriffen und einen Wandschmuck auf den Markt gebracht, der es nicht nur optisch, sondern auch akustisch in sich hat. Reduces sound vibrations that affect playback or recording. 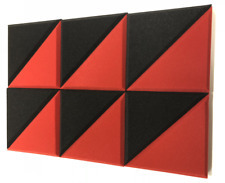 Auralex MoPADs - Studio Monitor Sound Absorbers. Aus Basotect. Schalldämmung aus Basotect. Absorptionsleistung Basotect. Weiß Basotect® B. Hellgrau Basotect® G . Grau Basotect® UF. Schalldämmung leicht gemacht. 12x Schalldämmung 50 x 50 x 7 cm. This Is A Great Stand In Vocal Booth. Especially if You Do Recording. Stand-in Vocal Booth. Booth Framing. Portable Stand-in Vocal Booth For Travel. Without All Of The Hassle And Expense Of Building Materials And Labor.Plus The Best Part It's Portable. This Is A Great Stand In Vocal Booth. Especially if You Do Recording. Stand-in Vocal Booth. Portable Stand-in Vocal Booth For Travel. In Your Bedroom. Without All Of The Hassle And Expense Of Building Materials And Labor.Plus The Best Part It's Portable. ARTNOVION - THOR ABSORBER - Set of 8. Thor is a versatile solution for the Pro Audio market. Easy to mount on both walls and ceilings. Reference :THOR ABSORBER. Referencia :THOR ABSORBER. Référence :THOR ABSORBER. GAIA II is designed for floor standing speakers weighing up to 120 lbs (54Kg). Internal reflections from the hard-supporting surface are attenuated resulting in greater sound clarity and openness. Optimal results are achieved by installing the GAIA isolators with the logo facing the listening position, or rotated 180 degrees, to align the isolators with the speaker’s motive forces. Simple fixings on the wood panel are designed to slot into the cavities of the foam, allowing the acoustic properties of a room to be adjusted in minutes, by simply adding or removing selected panels. Aus Basotect. Schalldämmung aus Basotect. Absorptionsleistung von Basotect. Weiß Basotect® B. Hellgrau Basotect® G . Grau Basotect® UF. Schalldämmung leicht gemacht. 8x Schalldämmung 50 x 50 x 10 cm. A classic Multi effet . Sonitus BigFuser II Skyline Diffuser Raum Akustik. Zum Glück geht das heute ganz anders. Sonitus hat hier wieder in die Akustik Trickkiste gegriffen und einen Wandschmuck auf den Markt gebracht, der es nicht nur optisch, sondern auch akustisch in sich hat. Aus Basotect. Schalldämmung aus Basotect. Absorptionsleistung von Basotect. Weiß Basotect® B. Hellgrau Basotect® G . Grau Basotect® UF. Schalldämmung leicht gemacht. 6x Schalldämmung 100 x 50 x 7 cm. VICOUSTIC - VICYCLE 60 (Set of 5). Vicoustic's VICYCLE is a product resulting from the recycling processes of flexible polyurethane foams. Vicycle 60 : 1000 x 600 x 60 mm (Lot de 5). Lot de 5 panneaux isolants vicycle 60mm. Ultimate Support UA-ISO-100 2x Isolator Pad. Ultimate Isolators have been designed to help you boost the accuracy of your monitors by providing a simple, affordable way to isolate your monitors from the surfaces you place them on.